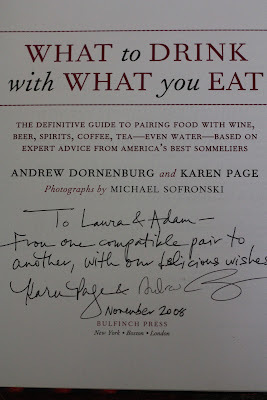 Pinot and Prose: THE FOOD LOVER'S GUIDE TO WINE and a GIVEAWAY! Hi, Laura! I know nothing about wine pairing, so, I think I need this! I like lots of wines in my mostly-ignorant way-- Argentinian malbec is a go-to for me in the fall! Oh no, Beth...here it comes...I have to do this..."You like me! You really like me!" LOL! Thanks for liking me on Facebook! You're entered in my giveaway! My favorite Pinot is "Patz & Hall's Gary Pisoni Vineyard's - almost all vintages. Pisoni's vineyard seems to consistently produce rich, earthy flavors that are clearly upfront but have a lasting effect on the palate. I will drink this with just about any food. Oooh, I've never had Patz & Hall...and I was so hoping this would happen when I posted this: finding new wines to try! And funny that you mention wines that pair well with all kinds of food. 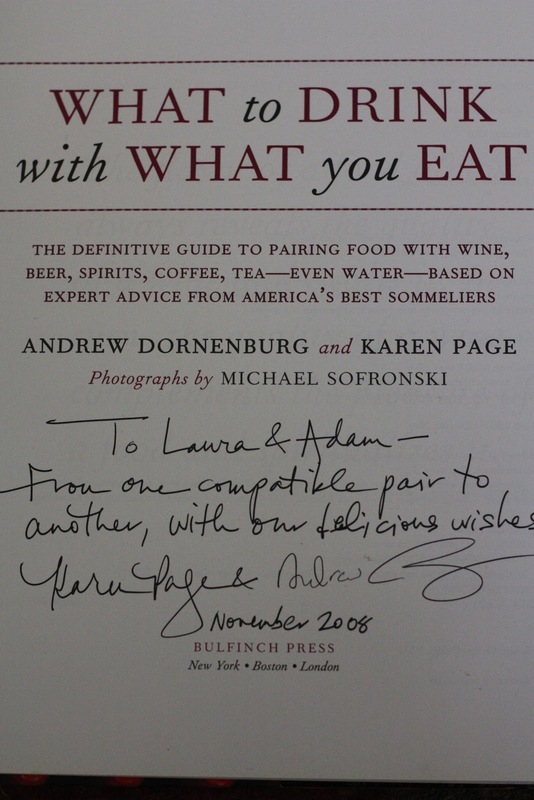 Page and Dornenburg mention a type of wine personality test, if you will. A wine that goes well with just about anything is "The Peacemaker" - I loved that. The Loyalist is your house wine, the one that you always have in your home, that pairs well with most foods you eat. Again, this is a way that the book gives the newbie a language with which to connect with wine. Thanks, Dave - I've entered you in the giveaway! Jordan, I loooove your style. I lack any sort of a sweet tooth, but what I love in the autumn and winter is a glass of port for my dessert, after dinner and after the kid has gone to bed. It's the simple things, really. One of my new favorites is Amaro Nonino - the bottle is so lovely and the taste is akin to port, though I think Amaro Nonino is more floral and delicate. I highly recommend it! If your wife likes Moscato, she might go for this as well. Thanks, Jordan! And I've entered you in the giveaway! Favorite wine? I like most wines, but one I enjoyed enough to take a photo of with my phone so that I would remember the name when I went to the store: columbia crest grand estates, cabernet sauvignon. The one I enjoyed and forgot to take a picture of ... well. Obviously I need to keep better track. Right now I'm enjoying red wines from Portugal. They are so food-friendly and easy drinking! Pinot Noir tends to be my default wine, since it goes so well with so much. But it's important to reach beyond and fine tune what we're eating and drinking together. And I'm with you on the Amaro Nonino. It's a great digestivo and a lot easier to handle than Fernet-Branca (that's some serious medicine!). This summer I had a wine affair with Charles Smith's Riesling (http://www.charlessmithwines.com/). I was sitting on my porch with a book in hand, and it was love at first sip. It is so crisp and fresh - perfect to eat with apples and sharp cheeses. Usually I'm more of a red wine gal, simply because I lived in Portugal where they make awesomely rich rioja-like vino. But this summer belonged to the riesling. Melissa...all I have to say is YES! There's a place here in NYC that does a Summer of Riesling. They have classes and tastings all summer, and they also did a Riesling crawl this past summer. Outstanding. As a result, I've been really turned on to Riesling - few wines show terroir more than Rieslings! Tanisha, Portugal is totally on my radar. I feel like you get really good quality...at ah-MAHZ-ing prices...in the U.S. Drink now before the rest of the country discovers them! Totally, Carol - when it comes down to it, Pinot Noir is probably my favorite. It's lovely nearly every time.